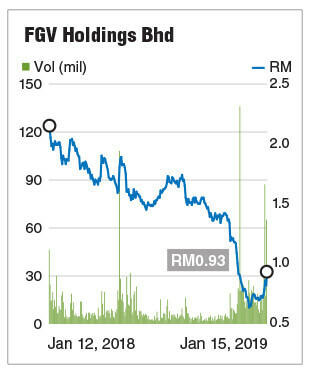 KUALA LUMPUR: FGV Holdings Bhd’s share price jumped to its highest level since end-November in heavy trading yesterday after the group’s chairman issued an unorthodox letter that helped dispel investors’ worries. The stock opened the day three sen higher at 85 sen before sustained buying interest saw it climb steadily to close at the day’s peak of 93 sen, up 11 sen or 13.41% from Monday. FGV — valued at RM3.39 billion after yesterday’s share price rise — was the day’s fifth most actively traded counter on Bursa Malaysia with 65.13 million shares done, about 6.5 times more than its 200-day average trading volume of 9.99 million shares. Kenanga Research said the uplift in FGV’s share price and improved perception of the stock came about after the management reiterated commitment to fixing ongoing leakages and operational inefficiencies faced by the group, as revealed in the letter penned by FGV chairman Datuk Wira Azhar Abdul Hamid to shareholders on Monday. In the letter, Azhar said the group had identified RM350 million worth of non-core businesses and assets for disposal, besides areas for the development of strategic alliances to plug capacity gaps where there are any, which will bring improved returns to shareholders starting this year. Kenanga Research reiterated its “market perform” call on FGV with a target price of 80 sen, adding however that it does not expect the news to alter its projection of a core net loss of RM187 million for the financial year ended Dec 31, 2018 (FY18), and a core net profit of RM60 million for FY19. This, it said, is because most of its legacy issues may require time before improvements and meaningul earnings can be seen, and minimal margin improvements in FY19 on operational efficiencies and less leakages have been accounted for. “However, we may look to increase our valuations should we see these positive steps come to fruition through earnings, while it is likely that this and the appointment of the new chief executive officer (CEO) may improve share price sentiment in the near term,” the research firm said in a commentary yesterday. For the nearer term, Kenanga Research estimates FGV’s core earnings for the fourth quarter of FY18 (4QFY18) — excluding fair value of the land lease agreement — to remain weak, in view of the lower average crude palm oil (CPO) price in the quarter of RM1,902 per tonne, compared with RM2,192 in 3QFY18. CIMB Research, while maintaining a “hold” rating on FGV with a target price of 92 sen, highlighted several areas of concern that could limit upside to its earnings projection. These include higher labour costs, potential provisions for its 50%-investment in Trurich Resources Sdn Bhd since 2009, rightsizing of its manpower, as well as rising competition for its sugar refining business. “We are positive on the aggressive key performance indicators set to turn around its operations and performance. If successfully executed, there could be upside to our earnings projection ... We will turn more positive when we see evidence of operational turnaround outstripping these concerns,” it added. Only TA Securities, out of 12 analysts covering FGV, has a “buy” call on the stock, according to Bloomberg data. “We are positive on management’s efforts to turn around its operations. If the turnaround plans are successfully executed, it will result in a significant earnings enhancement for the group,” TA Securities wrote in a news brief yesterday, adding that its target price is unchanged at RM1.01 per share. FGV went for listing as the world’s second-largest initial public offering in 2012, at a price of RM4.55 per share, raising a total of RM4.5 billion from the exercie. Azhar, in Monday’s letter, said operational processes are being improved under FGV’s transformation plan, which could help save at least RM150 million in 2019, and that the group should be able to earn a profit before tax of RM1 billion a year based on an average CPO price of RM2,500 a tonne. FGV is expected to make an announcement on the appointment of the group’s new CEO over the next few days. The position was left vacant after Datuk Zakaria Arshad resigned on Sept 18 last year.